1. Stalls that were going to hold up well over the years. 2. Tons of ventilation for hot summers. 3. Easy to use yokes in each stall. 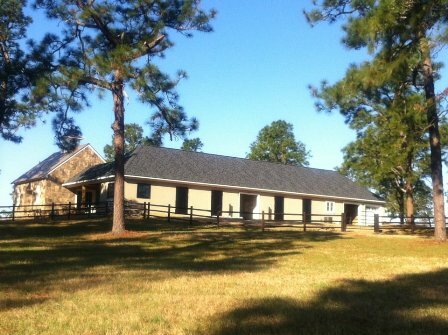 Here's how Lynn built a barn she (and her horses) are proud of...and got exactly the stalls she wanted. and don't compromise on the important stuff. So, she stuck to her guns when deciding on a stall system. She didn't skimp on her sliding door track, the heavy duty crosshatch mesh in the bottom of the stall, or the functional space she wanted, like the grooming stall. This is one of Lynn's favorite photos of a mare she rescued. 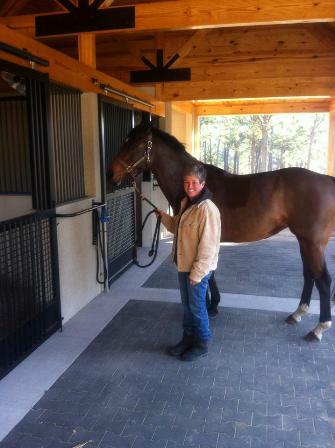 "I think she's proud of the barn, too," says Lynn. 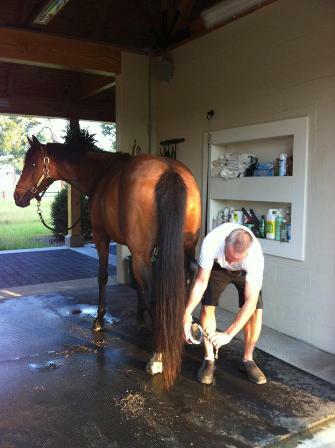 Keep horse health and safety at the forefront of your decisions. Good ventilation was important to Lynn. So, she designed her barn in a shedrow style. With crosshatch in the bottom of her stall doors and bars in the top. She also added dutch doors and individual turnout areas at the back of each stall for maximum airflow. Finally, she included grills between each stall. By being closely involved with the designer, the builder, and her Lucas Equine design expert, Lynn was able to ask questions and make decisions about horse safety throughout the entire design and manufacturing process. She customized her stall along the way to ensure she got exactly what she wanted. You're going to use these stall doors tens of thousands of times, so make sure they're designed with you in mind. Lynn talked to her friends about the yoke designs in their stalls. She tested yokes and latches in various barns. Based on the feedback from her friends and her personal use, she customized the size of the fold-down yoke to be extra wide. She also integrated the electric outlets into her stall fronts, to eliminate the need for conduit. 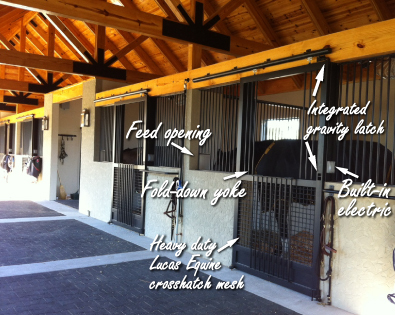 She chose the Lucas Equine integrated gravity latch for easy use, safe latching, and maintenance-free design. The grooming area has plenty of space and built-in areas for supplies. 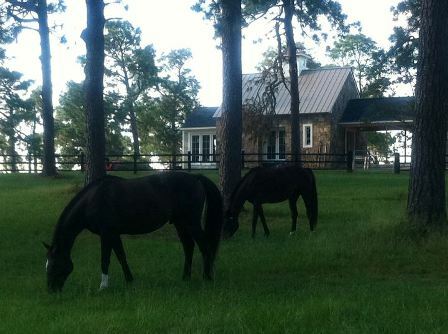 Lynn is pleased to have her horses settled in the new barn, and she already loves the great ventilation it is providing. And, I'm pleased to share a few more photos of her beautiful, inviting, and super functional barn. 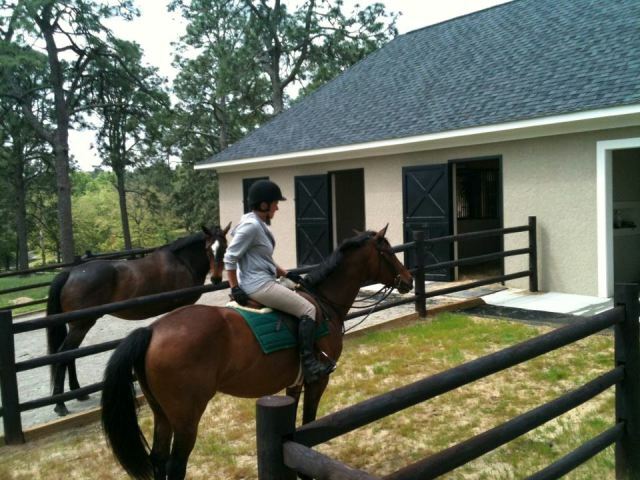 Lynn on one of her horses. This photo shows the dutch doors in the back of each stall, with attached turnout area. The positioning of this barn takes advantage of prevailing winds for great ventilation. The stonework and stucco fit so nicely with the warm tones of the natural landscape in Southern Pines.